These spools are put together very well and do the job just fine. I recommend these spools to anyone. Advantages: Very strong, durable and light. These things look great! They look excellent on my FZ09 and are pretty slim profiled. If you are looking for a larger spool and slider I would get the other larger sliders on this site. Advantages: Excellent product, slim profile, easy install! 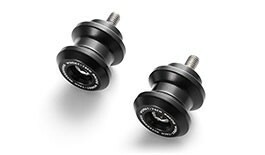 Excellent product, I had it TST Spools on my 2005 CBR 600 RR and I bought this set for my 2016 FZ-09. Fits perfectly, looks great and it is a solid product. It is WAY better than the eBay stuff! Comes with the hardware to install. Disadvantages: It is only offered in black.